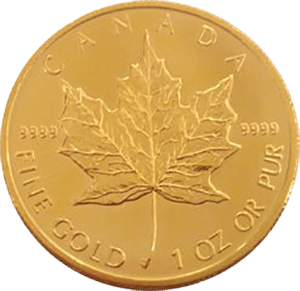 The 1 oz Maple Leaf is one of the iconic gold bullion coins on the world market. Beginning life in 1979, it is also one of the first coins produced to compete with the ubiquitous South African Krugerrand, which made up more than 90% of the world market by 1980. Such has been the popularity of the Canadian Maple Leaf coin that other nomination began were added ‘in 1982 (1/4oz and 1/10oz). By 1986 the 1/2 oz followed suit and 1/20oz and 1g coins are now available as standard. Special edition nomination have also been produced to mark historic dates and events, such as the Vancouver Winter Olympics in 2010. In 2007, The Royal Canadian Mint produced a then world record gold coin worth $3.5m (with a nominal value of $1m) and weighing 100kg. In all, five of these were produced, with one being stolen in 2017 from the Bode Museum in Berlin, Germany. The 1 oz Maple Leaf itself has a face value of $50 and is one of the purest coins on the gold bullion market at 24 carats. Due to improvements in refinement, the first editions of the coin from 1979 to 1982 (0.999% fine gold) were not as pure as those produced after (0.9999% fine gold). As is always the case with gold of this quality, the malleability of the coin can lead to it being marked and as a result it needs to be stored and handled with care. The 1 oz Maple Leaf’s diameter is 30mm and it has a milled edge. The coin is actually designed by the same team responsible for the Krugerrand and the only change over the last almost 40 years has been the portrait of Queen Elizabeth II, which adorns the coin’s obverse. On the inverse the iconic maple leaf gives the coin its name.